Property owners have a legal obligation to make sure that their property is safe and free of foreseeable hazards that could cause injury or harm to visitors and those who are invited to enter the property. Do not be misled by the term slip and fall because it may sound trivial, as if the person just gets up and dusts themselves off and keeps moving. 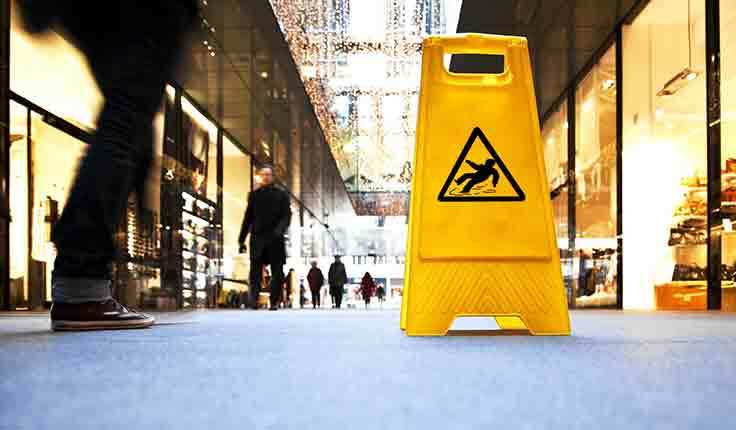 If a person were walking through a store with wet spot on a slick floor and they fell and broke an ankle, hit their head and suffered a severe head injury, that would be considered a slip and fall accident. Slip and fall accidents account for about 15% of accidental death in the United States, and 5% of falls result in fractured bones according to the National Safety Council. Falls are also one of the most common causes of traumatic brain injury, which is an injury that can have a devastating impact on a person’s life. At Yeboah Law Group, we are here to represent your rights when you have suffered a serious injury in a slip and fall accident on someone else’s property. Our Fort Lauderdale premises liability lawyers hold the responsible parties accountable when you have been injured because of a property owner’s negligence. What causes slip and fall injuries to occur? Who can be held liable for your injuries when you fall on someone else’s property? In most cases the property owner is responsible when someone who visits their property suffers a serious injury, but there are a few legal requirements before the injured person has legal grounds to take legal action. If the property owner knew about the hazardous conditions that caused your accident and they failed to remedy them, they may be held legally responsible for your injuries. If negligent maintenance on the part of the property owner caused the accident and injury, the owner may also be responsible. How can a slip and fall accident injury lawyer help? An experienced Fort Lauderdale premises liability lawyer will help you develop a compelling case that will prove the property owner’s liability for your injuries. As the person bringing legal action you will be the plaintiff and the property owner, the defendant. It is the plaintiff’s responsibility to prove that the property owner owed a duty of care to ensure that their premises was safe and hazard free, that the defendant breached that duty by failing to maintain the property to ensure the safety of those whom he or she invited to the property, and that the negligent conditions were the direct cause of the injury. The dependable Fort Lauderdale premises liability attorneys at Yeboah Law Group are eager to put their experience and dedication to work on your behalf. We fight for your right to recover fair compensation when you have been injured through no fault of your own. If you have been injured in a slip and fall accident due to the negligence of a property owner, you may wonder if your case is worth pursuing. An approachable premises liability attorney from the Yeboah Law Group is ready to sit down, discuss your case, and propose options for moving forward. You are invited to contact Yeboah Law Group at 1-800-TELL-SAM or complete our contact form to schedule a free consultation for thoughtful answers and intelligent legal strategy.